Jumble Cakes. 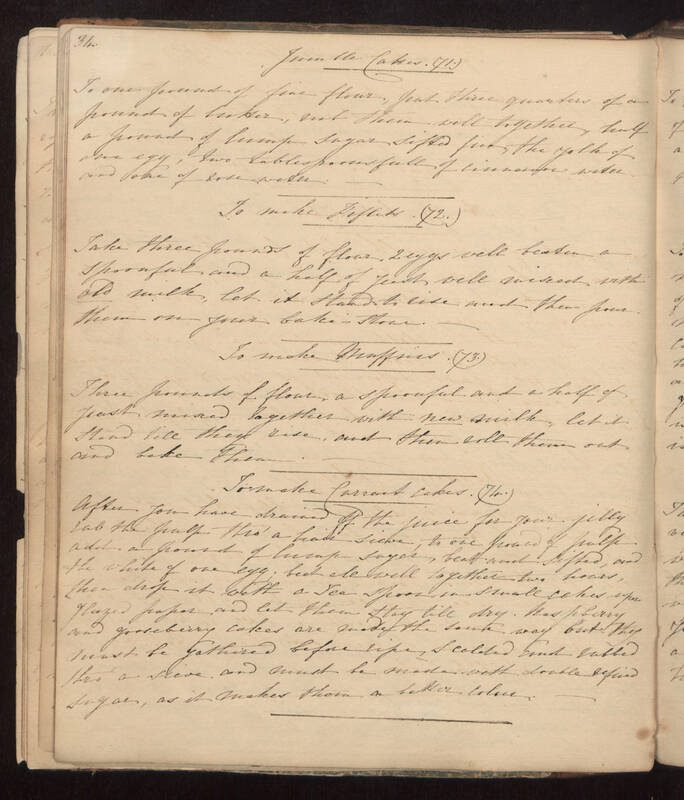 (71) To one pound of fine flour, put three quarters of a pound of butter, rub them well together, half a pound of lump Sugar Sifted fine, the yolk of one egg, two tablespoonsfull of cinnamon water and one of rose water. To make Piflets (72) Take three pounds of flour 2 eggs well beaten a spoonful and a half of yeast well mixed with old milk, let it Stand to rise and then pour them in your bake - Stone. - To make Muffins (73) Three pounds of flour, a spoonful and a half of yeast mixed together with new milk, let it Stand till they rise, and then roll them out and bake them. To make Currant cakes (74) After you have drained off the juice for your jelly rub the pulp thro' a hair Sieve, to one pound of pulp add a pound of lump Sugar, beat and Sifted, and then drop it with a Tea Spoon in Small cakes upon glazed paper and let them Stay till dry. Raspberry and gooseberry cakes are made the same way but they must be gathered before ripe, Scalded and rubbed thro' a Sieve and must be made with double refined Sugar, as it makes them a better colour.